Hannibal, MO – A brisk autumn morning did not stop the competitive will of 99 5K Trojan Turkey Trek participants. When the cannon sounded, runners and walkers began the 5K trek through the HLG campus, nature trail, and adjacent neighborhood. The first competitor to top the hill and make his way to the finish line completed the trek in 16:57. 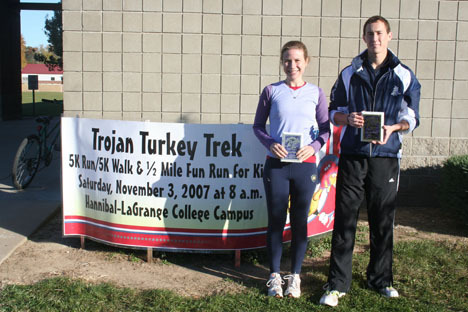 Ryan Humphreys of Hannibal, MO, won overall first place in the annual triple T race, followed by Christine Kuenster of Illinois, with a time of 21:25. Overall male HLG alumni winner was Peter Hokansen (22:32), and the overall female HLG alumni winner was Penny Landers (25:46). Click here for a complete list of results. Planning for the 3rd Annual Trojan Turkey Trek is already underway. Mark your calendars for Saturday, November 1, 2008. For more information regarding the HLG Trojan Turkey Trek, please contact Jo Ann Raney, director of alumni services, at 573-221-3675 ext, 208.